Lymphatics and Lymph Circulation: Physiology and Pathology is a comprehensive account of the physiology and pathology of lymphatics and lymph circulation, with emphasis on the question of lymph flow as well as the problems of capillary filtration and diffusion in the connective tissue. These intricate processes are explained from a uniform point of view. Comprised of 27 chapters, this book begins with a discussion on the origin and architecture of the lymphatic system, paying particular attention to the discovery of lymphatics and lymph circulation; the phylogenesis and ontogenesis of lymphatics; and general and special anatomy of the lymphatic system. 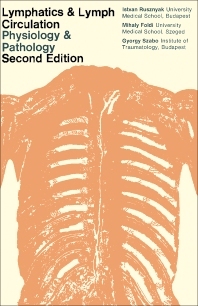 The second part explores the general physiology and pathology of the lymphatic system and includes chapters dealing with the role of the connective tissue in lymph formation; absorption into lymph capillaries; filtration and absorption through serous membranes; and lymph flow and composition. The remaining chapters consider the central nervous system and other organs such as the heart, lung, liver, kidney, and pancreas. This monograph will be useful for students, practitioners, and researchers in physiology and pathology.